Besides finishing up my decorating there are a number of other duties I need to attend to! Here’s a glimpse into my holiday “hit” list! 1. Love this sequin mini from J.Crew. I love the idea of mixing something sequin in with my every day clothing…. 2. Who can go wrong with Mr. Boddingtons? I need to send out my cards very soon. 3. A simply elegant up-do, the perfect look for any holiday party! 4. I’m going with a striped wrapping theme this year! 5. Veuve Clicquot Rose – need i say more? 7. I am having a small family fete on Christmas eve, these gold specked plates from Crate and Barrel are perfect! I also have that J. Crew mini on my wish list! So fab! PS – invite only sample SALES on my post today – 96% off retail baby! pink champagne is never a bad thing!! the hair is just perfect for a glam evening on the town! Your hit list is perfection. I'm so channeled into wearing sequins with some everyday pieces. While I'm @ it, doing my housework sipping on some Veuve C. Rose! 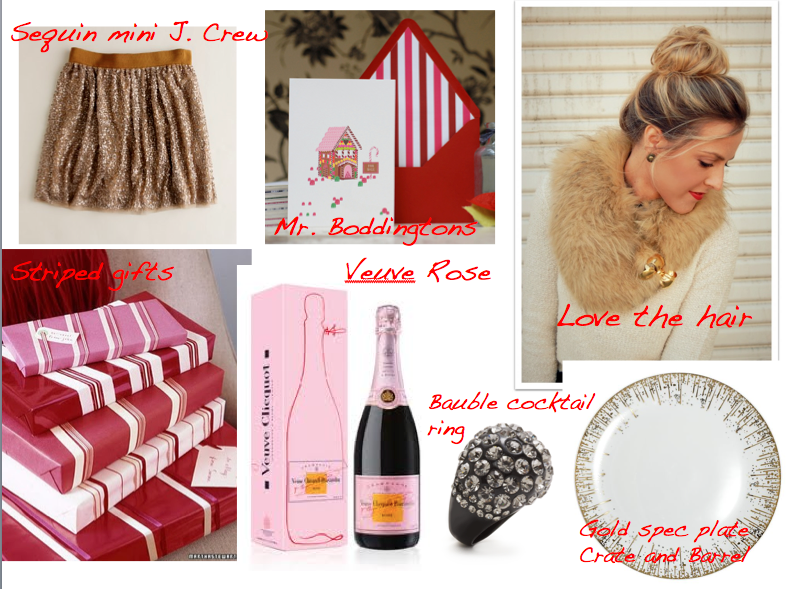 Love the sequined mini and who doesn't love a bit of Veuve Clicquot?? ?